The Before You Decide (BYD) Relationship Quiz is a new resource from Care Net that will jumpstart your relationship coaching. 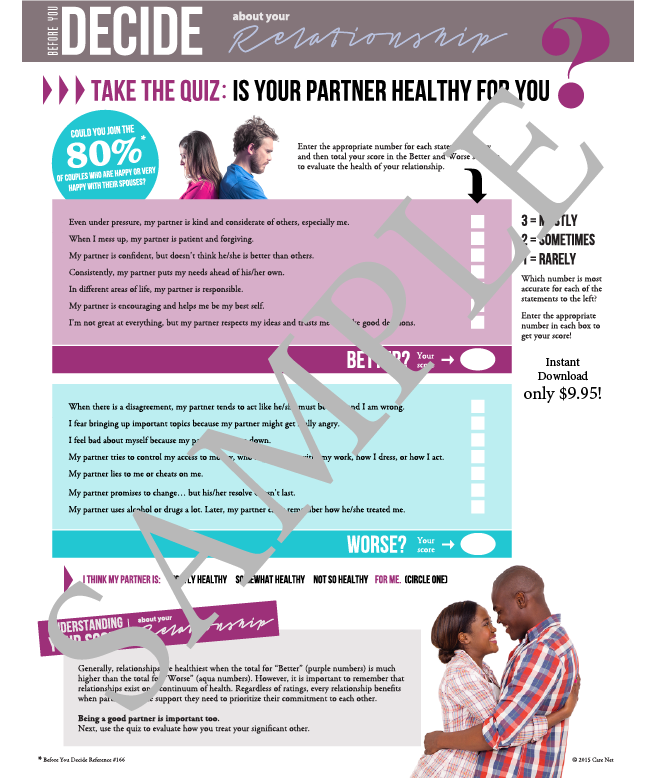 This non-threatening quiz is another opportunity to connect with clients regarding their relationship health. This tool can be utilized in coaching as you help clients explore whether they could be happily married. The friendly and familiar quiz format matches the styling of Care Net's BYD magazine and the new BYD:Live tablet app. This downloadable resource includes two versions of the quiz and an unlimited license to reproduce it for use within your center. The second version is a fillable PDF - the client can enter a number corresponding to their answer and the tool will automatically calculate their score. Use this version on a tablet or other device and then email a copy to your client (with their permission, of course).